"Pets have brought their People to April in Edom~An Ole Fashion Street Fair, for 12 years. On April 8 & 9, your Pet gets a bigger spotlight as his krewe builds a Paws Parade Float, competes & wins $1,000 in prizes during the 2pm Paws Parade & Contest! What’s a Krewe? Fun Family or Group of 2-10 people laughing & playing together to build a Float to complete in the Paws Parade. Think: non-motorized Wagon, stroller, wheel chair,etc. Surprise us!. Bring your Float decorated or build it on-site. Supplies available for purchase. No float? No worries! A Pet can also walk in the 2pm Parade with his Person, Family or Group of Admirers with prizes for Best Dressed, Look Alike or Best Float. The $250 cash & prizes go to your Pet, of course. Kick-off Saturday with 8am 5K Fire Run benefitting the Edom Volunteer Fire Department. Be sure to keep your person on a leash; then head over to free 10am to 5pm, Festival. What else is going on? Sniff out 125+ Vendors with pet items & gourmet foods, handmade folk & vintage items, festival foods for people and an awesome Kids' Zone with crafts and activities. 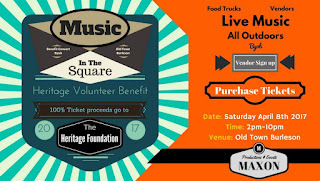 Perk up your ears listening to Performers on 3 Stages and end Sat at 7 pm with a Concert at The Old Firehouse. All are Pet Friendly venues. Preregister & pay entry fee April 5th or by noon at the Fair." Just 11 miles south of I-20, exit 540; Between Tyler & Canton. "A wide variety of vendors featuring one-of-a-kind items such as home & Décor, clothing and accessories, handbags, jewelry, religious articles, artwork, candles, delightful goodies, and so much more! Supporting the Brigade Drill Team. Free admission, raffle drawings all day long!" "With over 60 vendor shoppes at our indoor event you are sure to find some amazing must-haves! We have crafters, boutiques, food, crochet classes and more! Join us for a free egg hunt for kids and bring your camera to get pics with our Easter Bunny! Free to attend! Free Parking! Free Egg Hunt! Free Pictures with the Easter Bunny!" "Please join us for the 1st Annual Guyer Band Craft Fair at Guyer High School! If you participated or shopped at the annual Choir Craft Show in the fall, expect a very similar layout for the upcoming Band Craft Fair. The Fair will go on rain or shine; the majority of the vendors will be inside! Performance times for local musicians will be announced as the schedule is finalized. 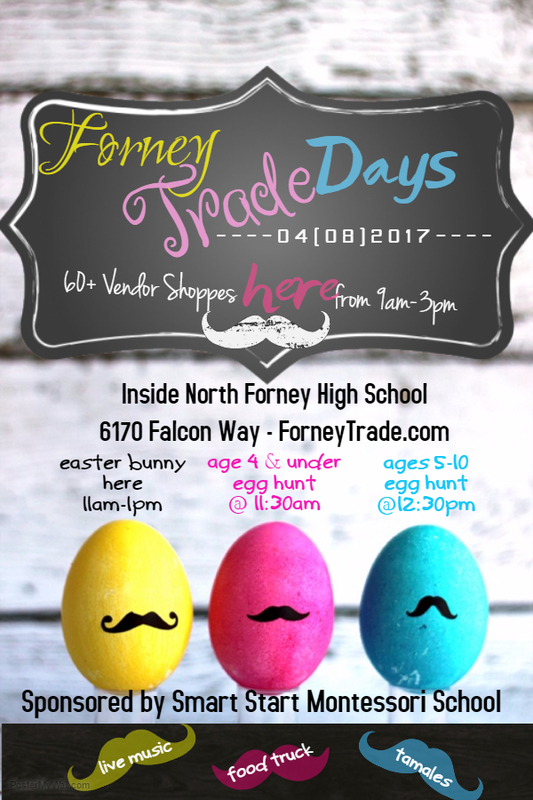 Come see us - you're sure to find something unique for Easter, Mother's Day, that special graduate, or yourself! Thanks for supporting the Guyer Band!" "Antiques hold stories, often untold, about where they’ve gone, about what they’ve witnessed, about the people who made and owned them. They were not made by machines but by the working hand. This Mistress has been in the antique business for almost 20 years & has collected some fascinating items. Mistress of Junk is beyond happy to present stunning hand picked antique dealers from the DFW area that offer amazing one of a kind finds displayed in exceptionally unique ways. You can peruse through and find gorgeous vintage rhinestone jewelry, embellished vintage clothing, stunning vintage furniture, Christmas decor & everything in between. There is a diverse array of styles & ages, so you will find something for everyone." "Spring forward and shop local! Join us at the Hilton Garden Inn-Allen for a 2 day Community Craft & Vendor Show. Attendance is free and open to all ages! We'll have 40 vendors selling their products in many different industries. WERE Community is a 501c3 charitable organization providing educational resources to women entrepreneurs. We are a 100% volunteer based organization." "In collaboration with the Bedford Cultural Commission, the City of Bedford presents ArtsFest, a family friendly event to promote and celebrate the arts in Bedford. This festival will feature artists, musicians and performers who contribute to the vibrant heritage of the North Texas region. Enjoy an assortment of food trucks, craft beers, wine, musical entertainers and art of all shapes and sizes at the historic Boys Ranch Park. In years past, the city has seen a tremendous outpouring of residents and guests supporting this endeavor and we hope to continue with the tradition. The Bedford ArtsFest is a single-day event that adds vibrancy to mid-cities by creating opportunities for people of all ages, cultures and backgrounds to celebrate the arts of North Texas." "This is Park Glen's biggest Spring Event. Spring Festival and Eggstravaganza brings out over 2000 neighbors! There will be egg scrambles, shopping, food, face painting, a few other activities and of course, the Easter Bunny!" 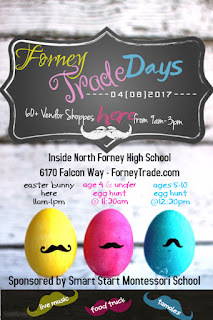 "This is an outdoor gift market/craft show at Tarleton State University in Stephenville, TX on April 8, 2017 benefiting the Texan Stars Dance Team at the Alumni House during Freshman Orientation from 9am to 4pm. All types of goodies to welcome in spring. Food, Fun and Shopping!" "Because we want this to be a great experience for vendors, shoppers, and families of the community, we're throwing everything we have into the preparations necessary to make this an unforgettable holiday event. Attractions include: plenty of great food, over 40 local vendors, free professional photo with the Easter Bunny, cake walk, kids' crafting station, remote control boats, and raffle! Don't miss this opportunity to participate in a wonderful, affordable family event close to home. Please join us to support local small businesses from Springtown and Azle, enjoy great food, and have some good, old-fashioned fun."